Children’s book review - Can I Join Your Club? ECMS Teacher Matara from Oakhill Children’s Centre in Reservoir tells us about one of the children’s favourite books, Can I Join Your Club? by John Kelly and Stephen Laberis. ECMS is thrilled to welcome the first families to its state-of-the-art Altona Early Years Hub, which opened on Wednesday 9 January 2019. 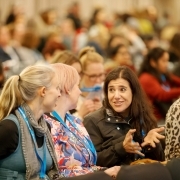 On Friday 17 August 2018, 700 ECMS early childhood professionals came together for another successful Beyond Tomorrow Conference at the Moonee Valley Racecourse. ECMS Educator Kristen from Oakhill Kindergarten in Reservoir tells us about one of the children’s favourite books, 'Do Not Open This Book' by comedian local Andy Lee. Recognising parents and families as children’s first and most important teachers, ECMS centres encourage families and communities to contribute and participate in every facet of their children’s kindergarten and early learning experience.